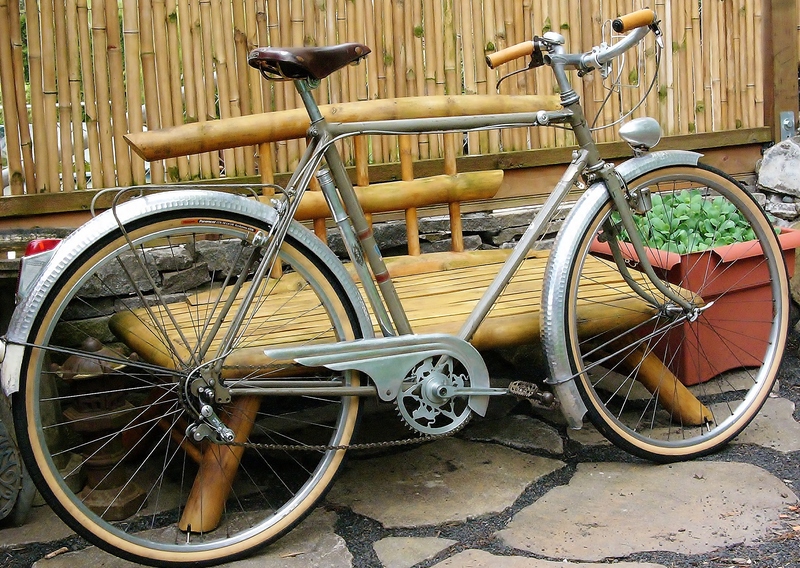 Restoring vintage bicycles, especially those from the “golden era” which lasted from the 30’s through the 50’s, sounds vaguely romantic and thrilling. Which it can be. 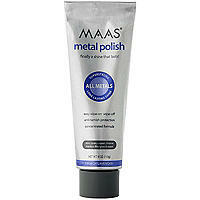 But the truth is that it can also be a very solemn and tedious process, full of stops and starts. 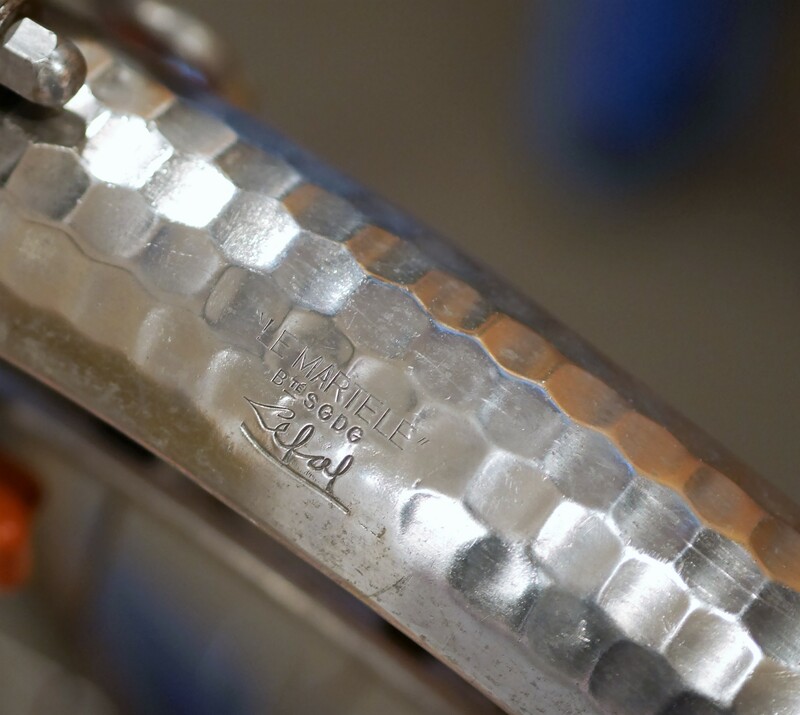 This late forties or early fifties Mercier Mecal Dural is one of those projects that can test your resolve. 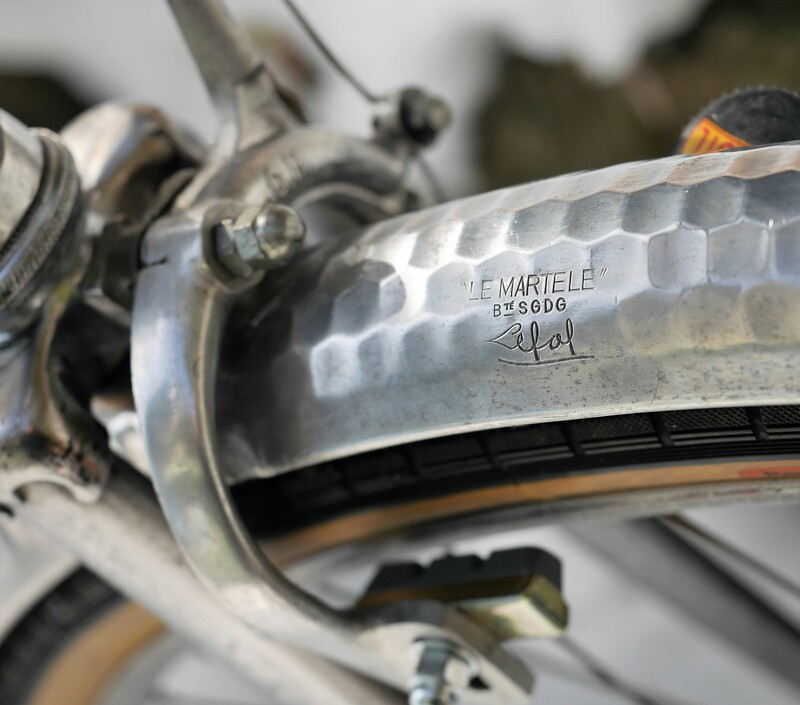 The bike, whose frame is made from aluminum “duralumin” tubing, was not 100% original, yet the frame itself was in beautiful condition. 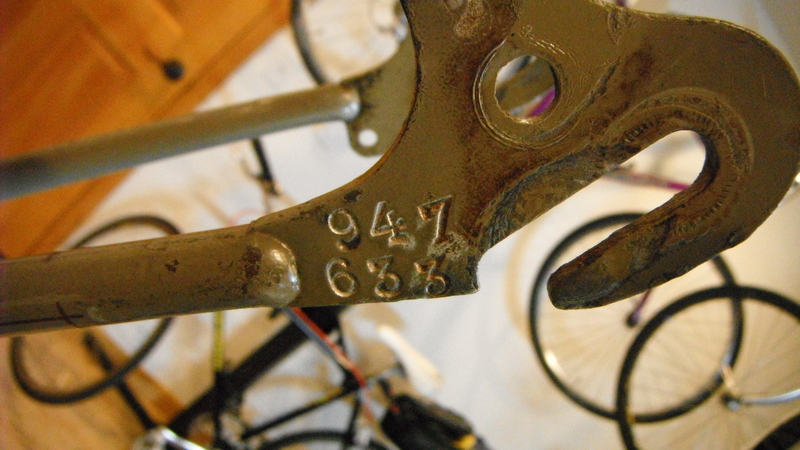 Over the course of its life, someone had tried to mount 700c wheels from the 1970’s on this late 40’s/early 50’s bike designed for 650b rims, and had spray-painted over the rust and corrosion on the bike’s original steel fork. 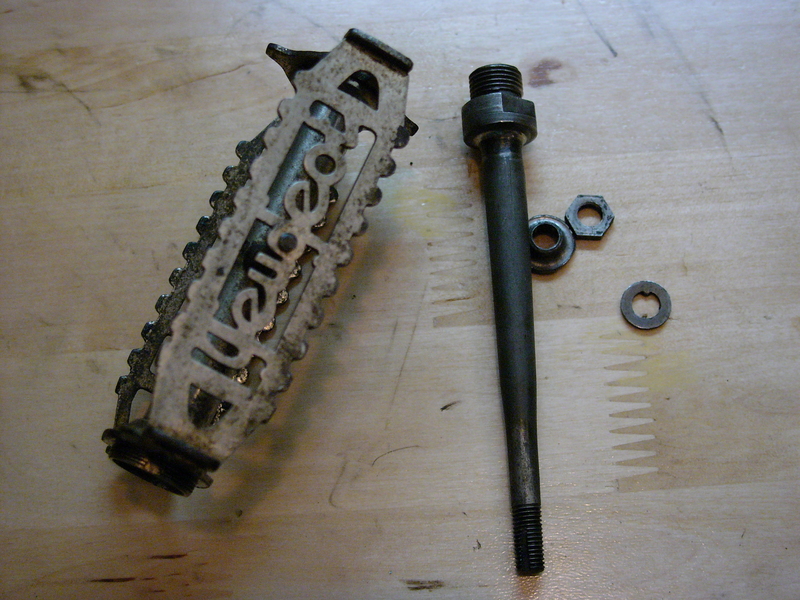 Some parts were missing, such as the original chain guard as well as the bike’s bolt-on attachments for the shifter and chain guard. 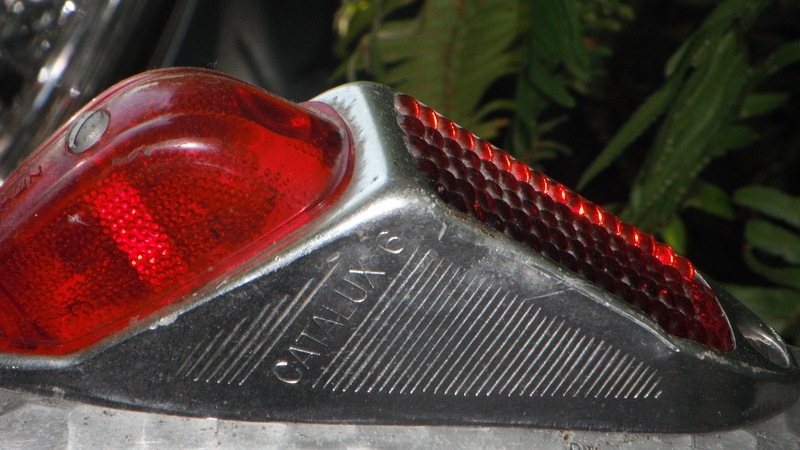 And, the Meca Dural head badge was gone. 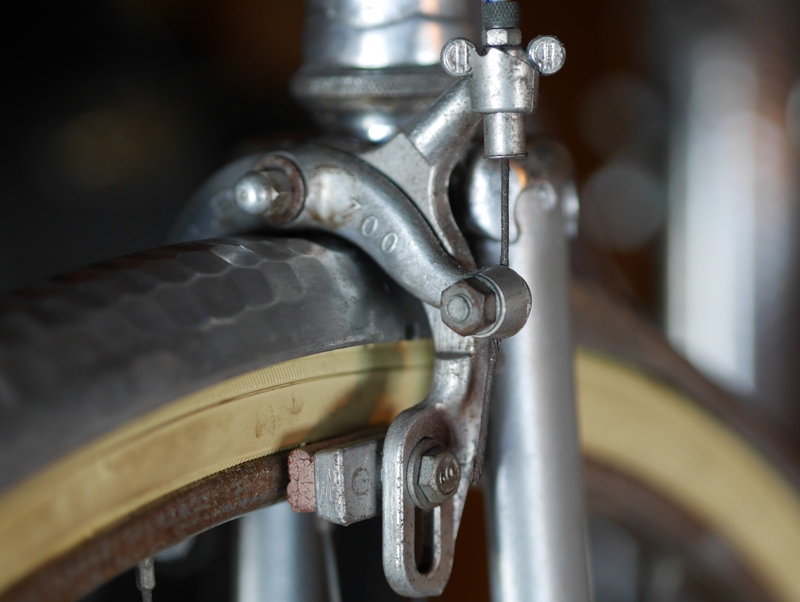 Undeterred, I set out to research the history of this method of frame building, as well as to find as many other examples of these frames as possible. Fortunately, I was successful on both counts. 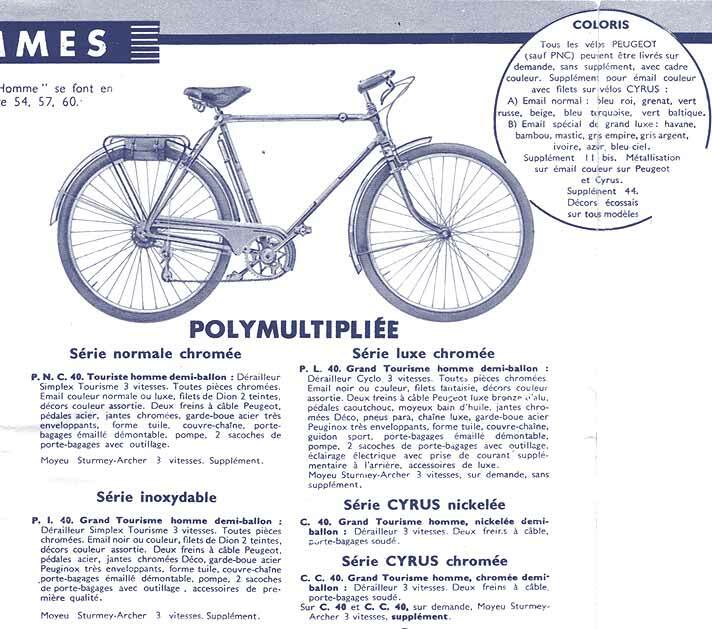 Several others before me have successfully restored these bicycles, and there is a decent amount of information available on the web and in print which gives a history and background for this interesting frame construction. 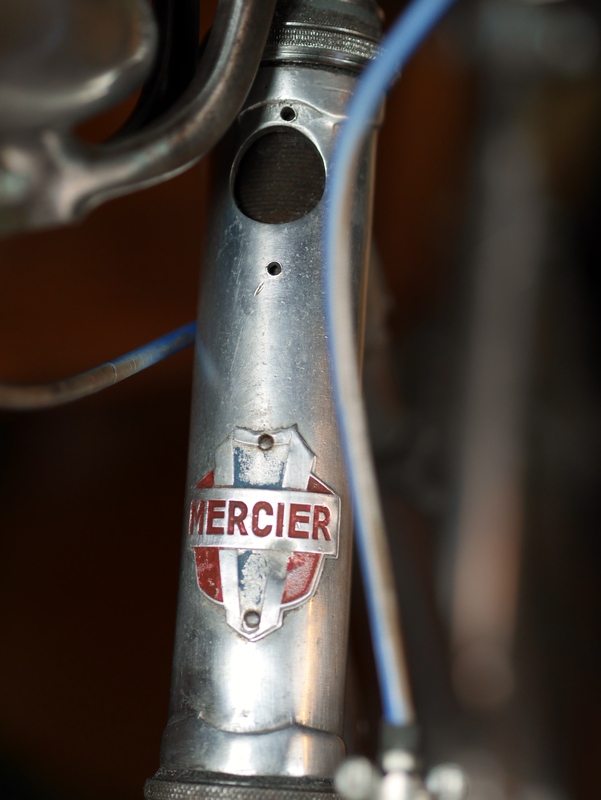 However, I still haven’t been able to locate any information on the serial number scheme used by Mercier. This frame’s SN is 16822. My first task was to find a 650b wheelset from the same era. 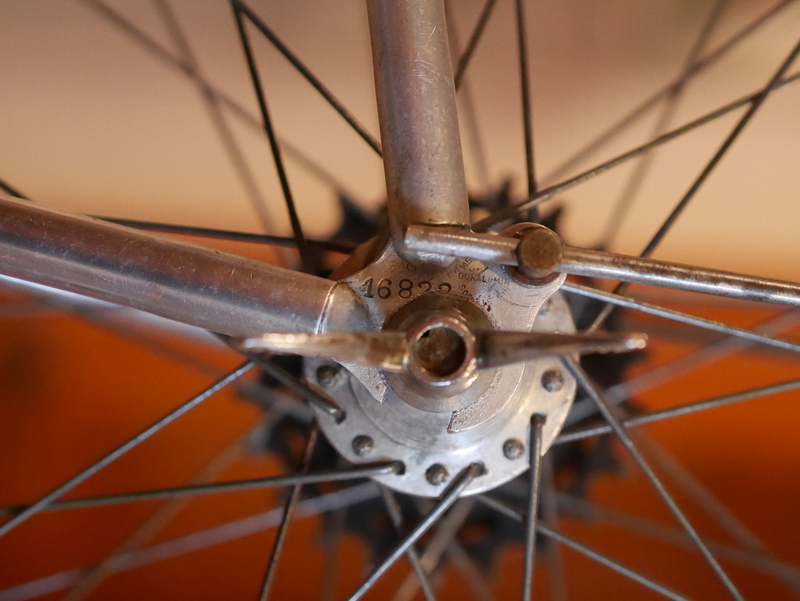 I harvested the wheelset from another project, which dates to 1953 and features Mavic aluminum rims laced to Fratelli Brivio hubs. 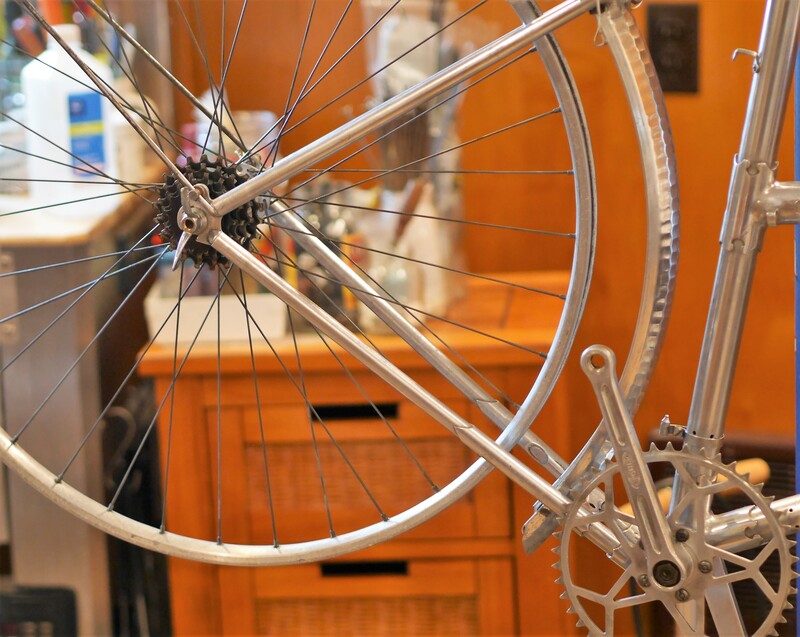 One of the initial challenges involved rebuilding and restoring the wheelset itself. 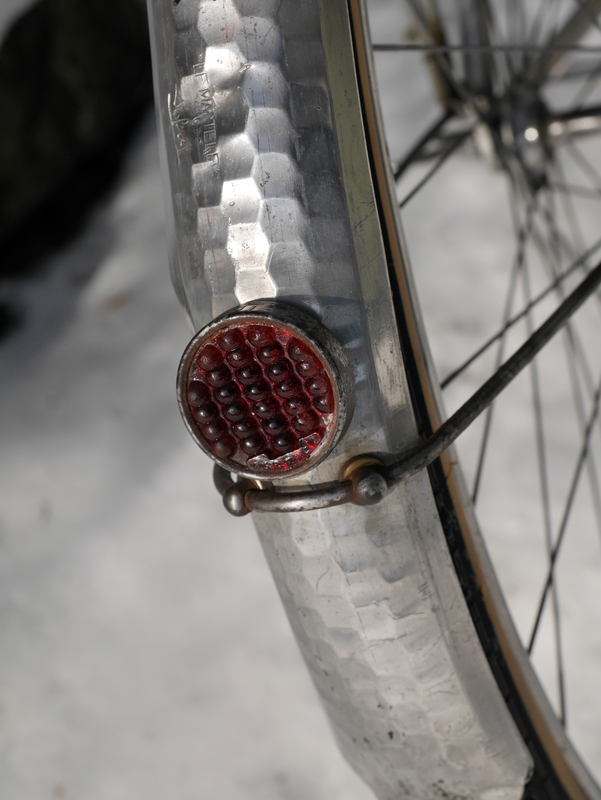 While the front hub was easily brought back to its free-spinning glory, the rear hub proved difficult. 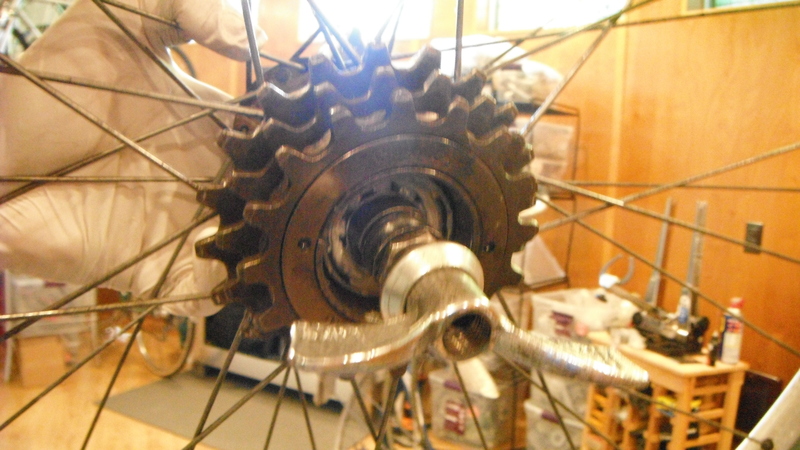 I was not able to remove the unbranded 4 speed freewheel from the hub, lacking the particular removal tool. 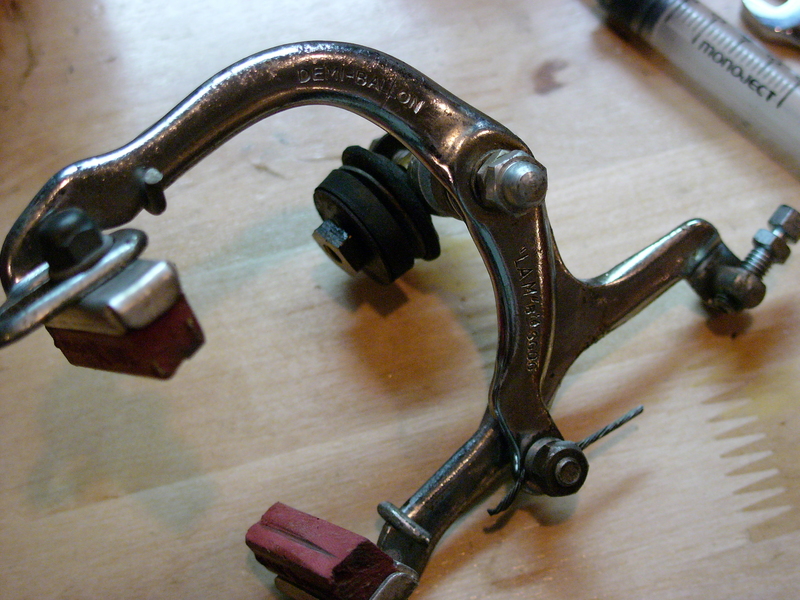 I modified a Suntour two prong remover, applied copious and various kinds of lubricants to the threads, used both my vise and my giant-sized long-armed wrench, to no avail. 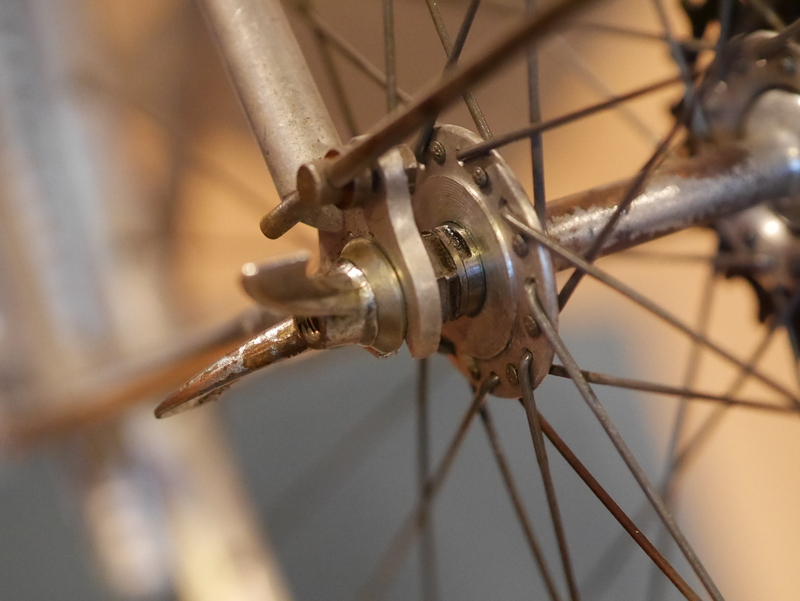 I didn’t want to take this freewheel apart – it is working fine and will probably last another 60 years. 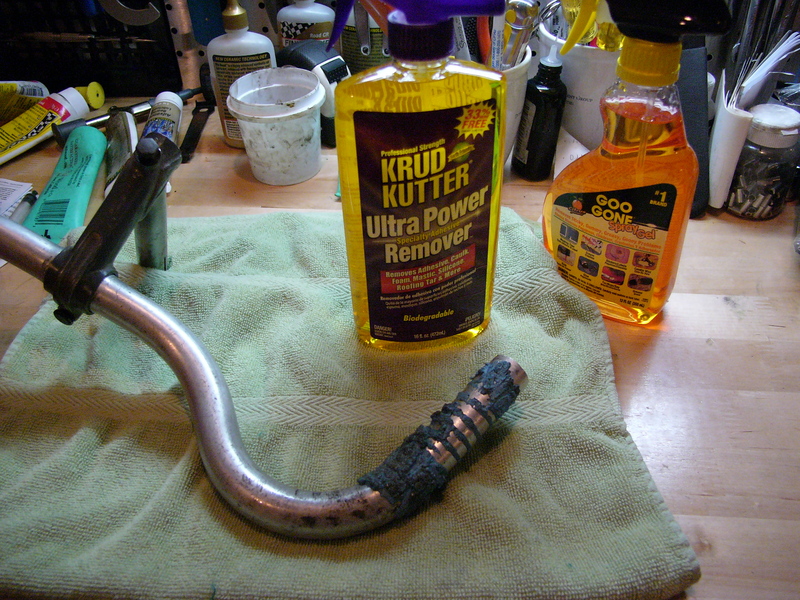 So, that meant cleaning and rebuilding the hub with the freewheel attached. All went well until I discovered that the original axle was slightly bent. 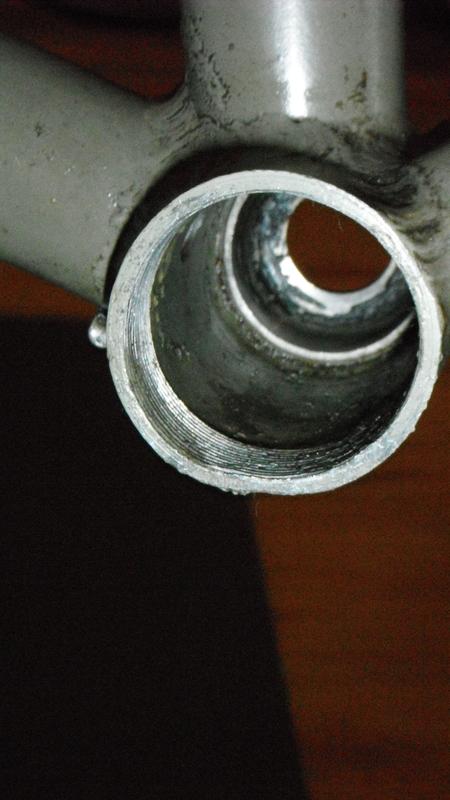 When I was ready for the hub’s final adjustment, I found that the axle could not turn in the hub, due to the zero distance between the hub shell and the cone. 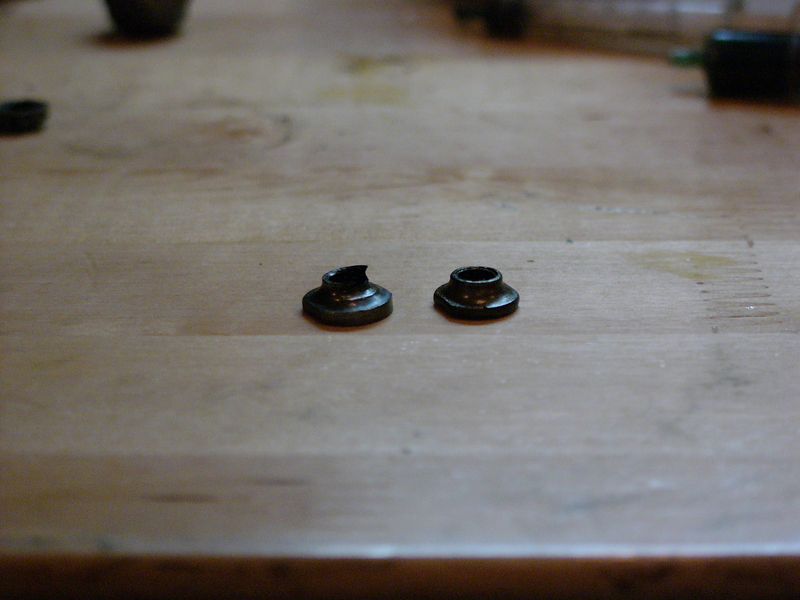 This particular hub has no dust cover, so I couldn’t strong-arm the opening by widening the dustcaps themselves. That meant trying to find another perfectly straight 9.5mm axle of a similar length and with similar threads. 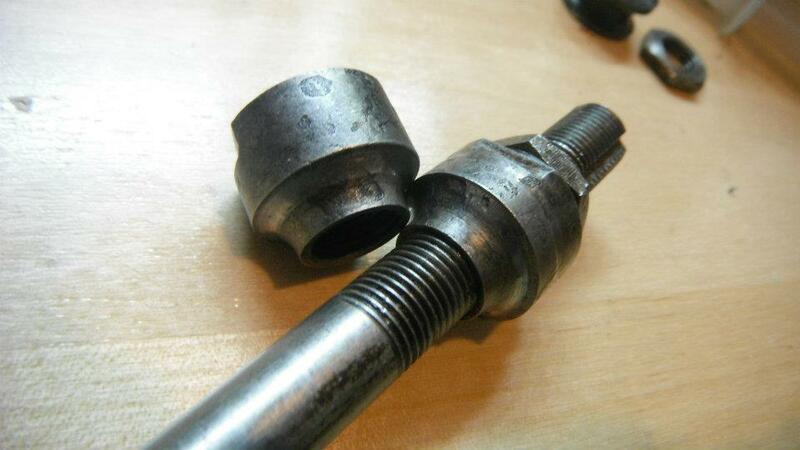 Amazingly I had ONE such axle in my parts bin – it was only slightly shorter than the original axle. Whew! On to the next problem. 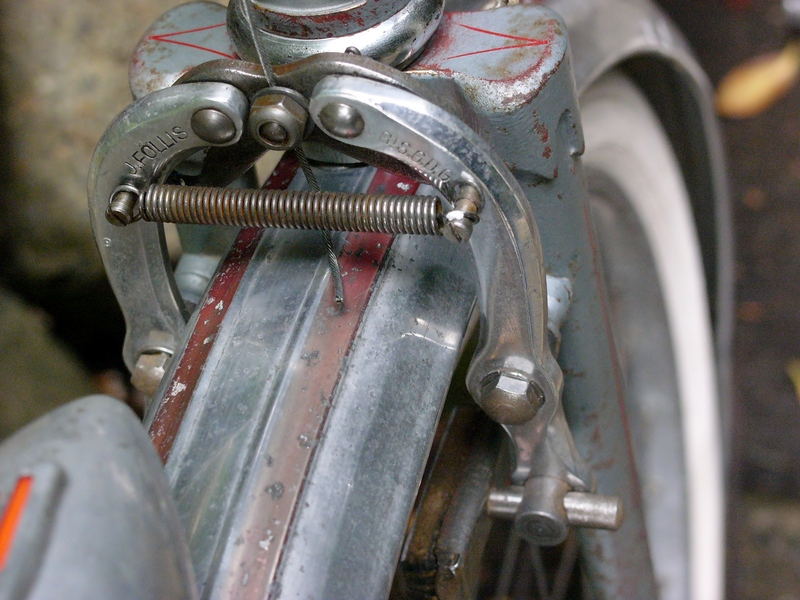 Once I had the wheels rebuilt it became clear that the CLB 700 sidepull calipers were probably not original to the bike. Their 70cm reach is not quite long enough to engage the 650b rims. Darn it! The extra reach needed is only about 2mm. 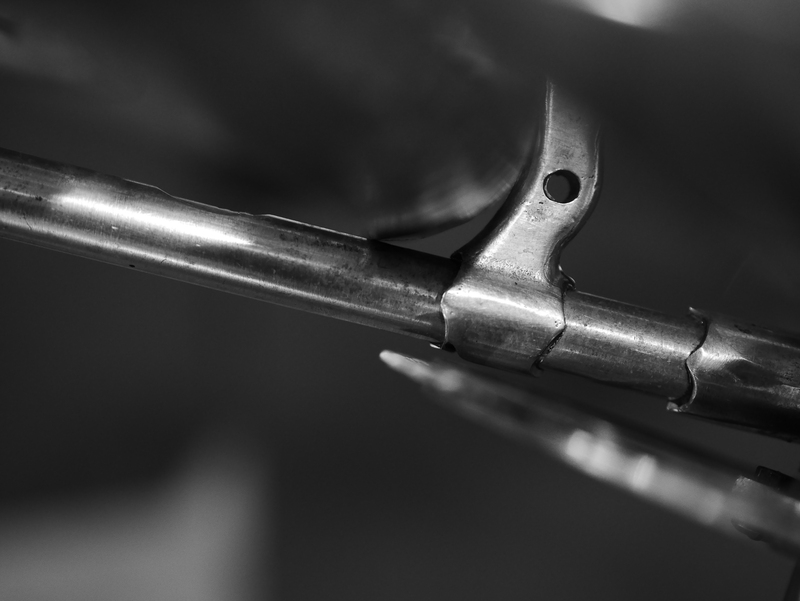 When there is enough material on the brake calipers to allow for it, you can take a round file and sand the opening lower at the bottom of the caliper arm to allow for a slight improvement in brake reach. 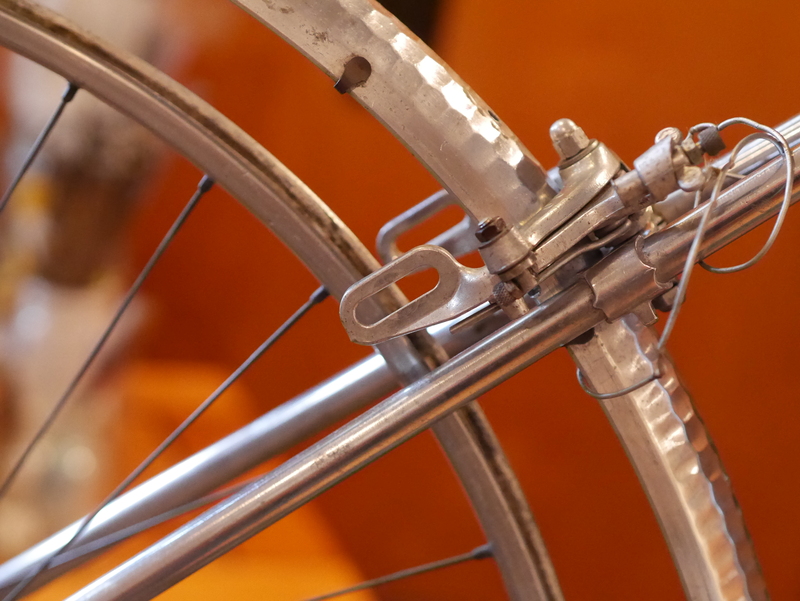 But, these calipers do not have enough material on the lower brake arms to make me comfortable with this approach. 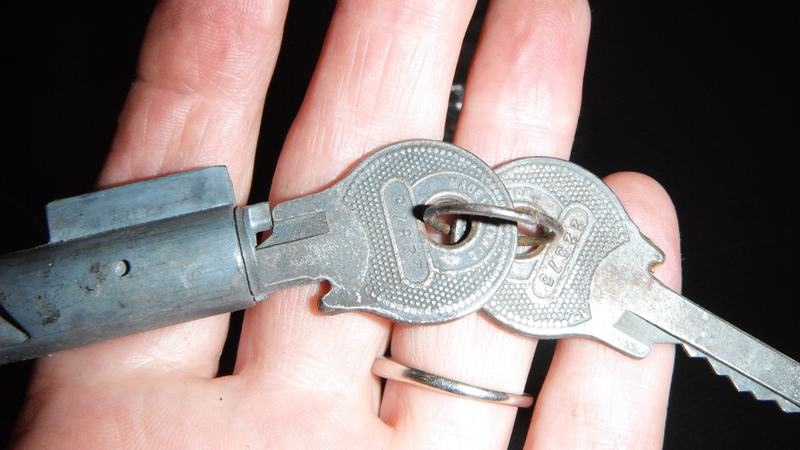 Instead, I will now locate long reach side pulls from this era. One more setback. 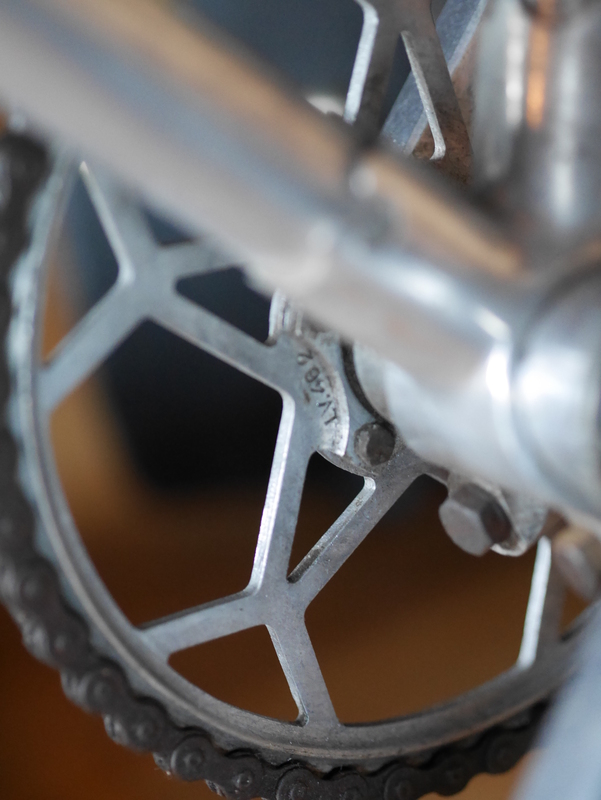 Then it came time to rebuild the bottom bracket and install the beautiful, lightweight Stronglight 49D crankset, with its 46T Louis Verot chainring. Everything went well until I observed the clearance of the chainring to the frame. 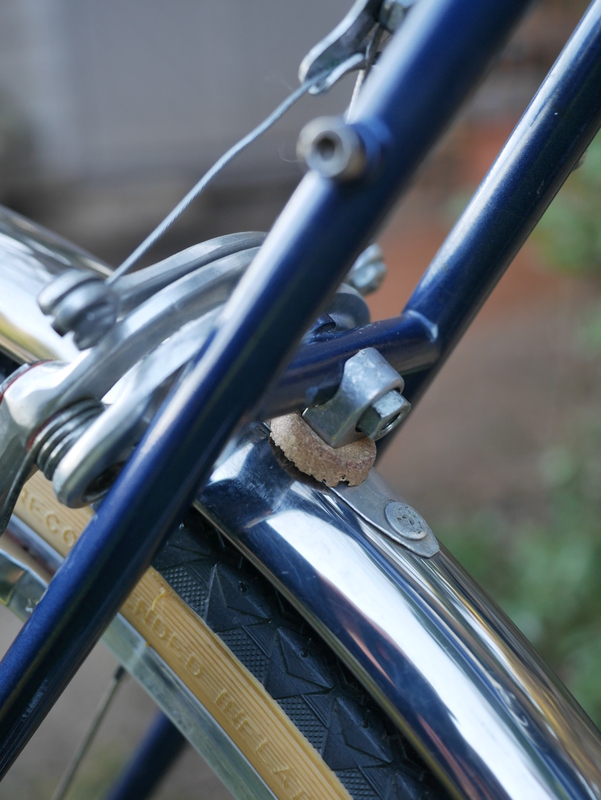 I had previously noted what I thought was a crimping mark on the sleeves which serve as the chainstay fender bridge. 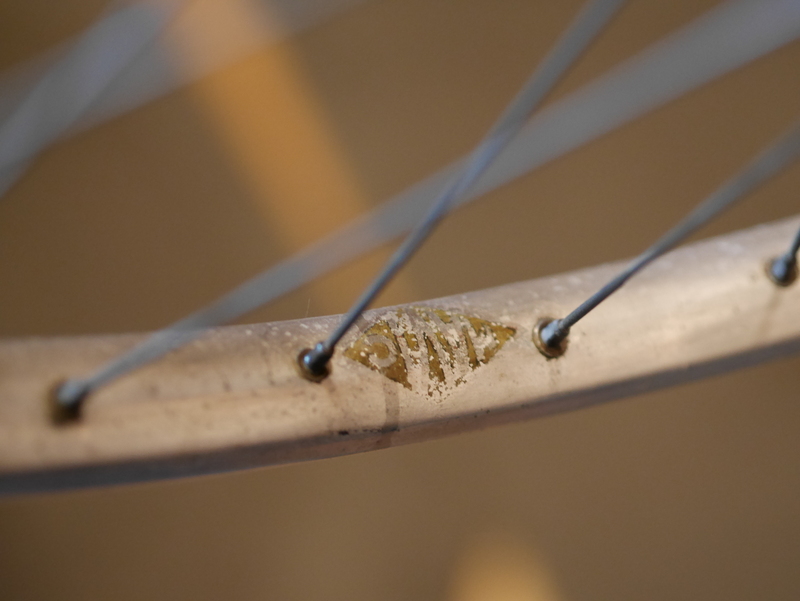 When I looked closer, I realized that the “crimping mark” was actually a gouge caused by the chainring contacting the frame at the chainstays, probably under vigorous pedaling. Investigating further, I found that the chainring itself had a wobble, which is not unusual for this type of crankset with a tiny bolt circle diameter. 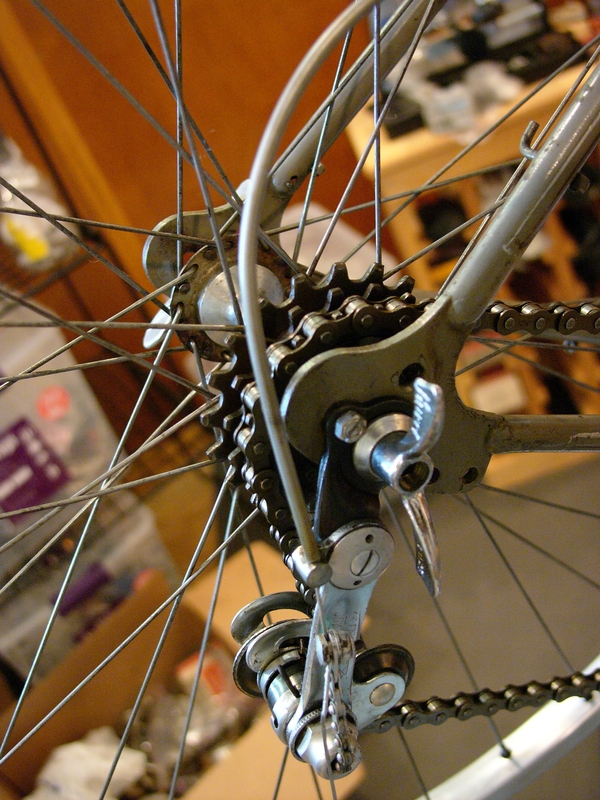 A larger diameter can resist stresses from the rider, but the downside is that a larger diameter BCD cannot accept tiny chainrings needed for climbing. 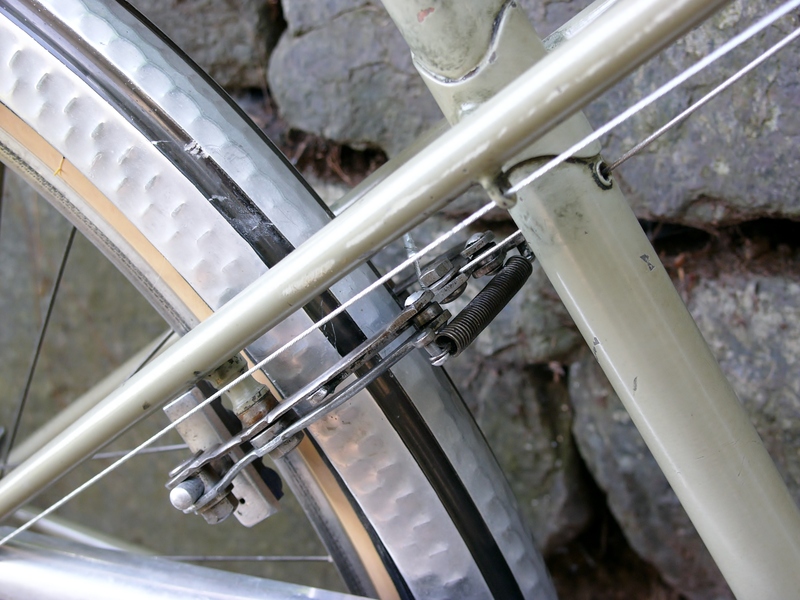 One of the things I learned in my research about these duralumin frames is that the bottom bracket shell is set up to provide for chain line adjustment. 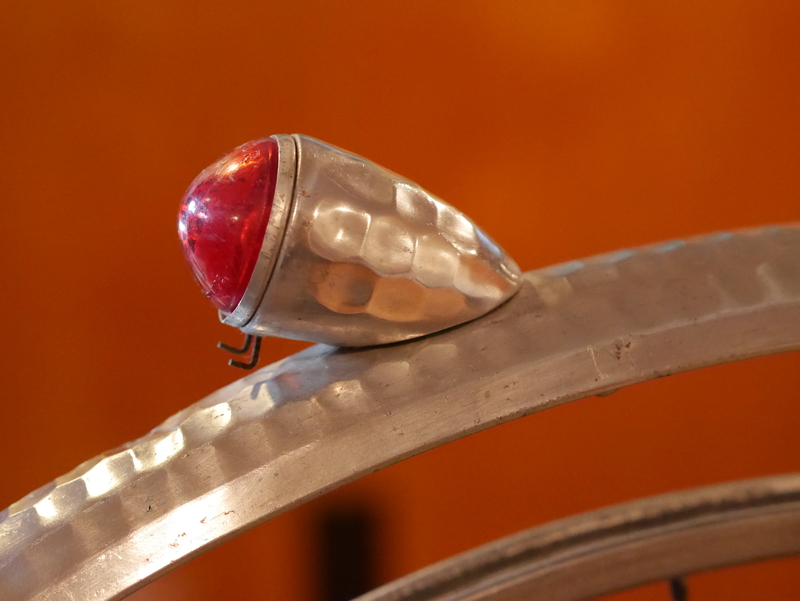 The shell is a simple aluminum cylinder, held in place with bolts. 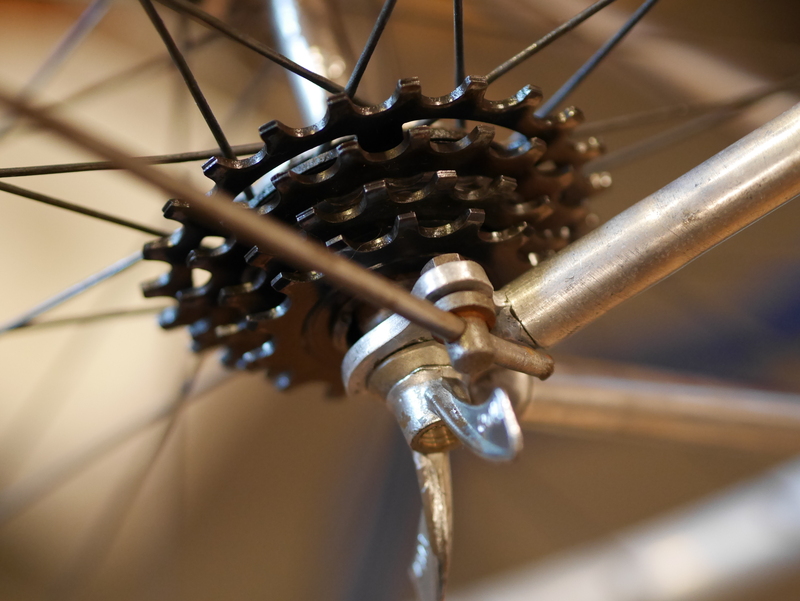 In order to address the issue of the crankset contacting the chainstay sleeve under vigorous pedaling, I first measured the torque setting on the bottom bracket bolts, referencing the highest setting at 100 inch pounds as being the most accurate. 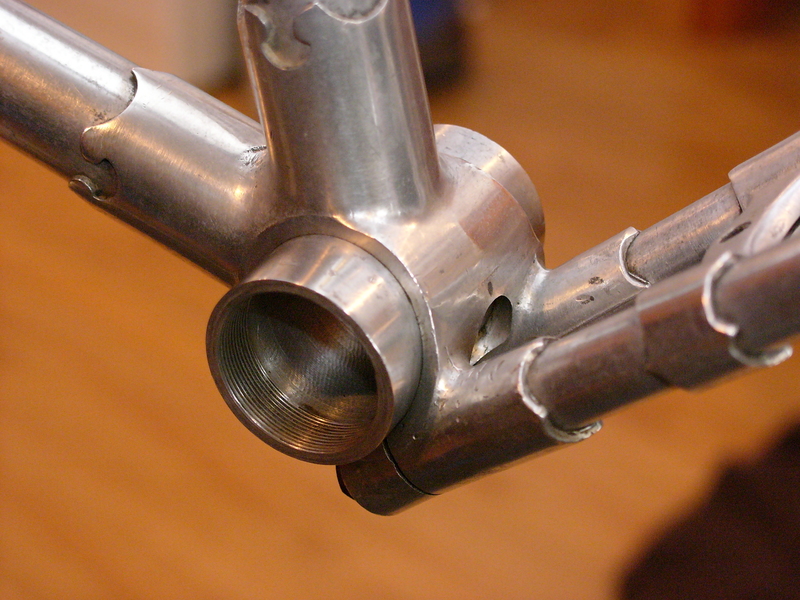 After removing the bolts, I twisted the BB shell using the locking on the non drive side of the bottom bracket. 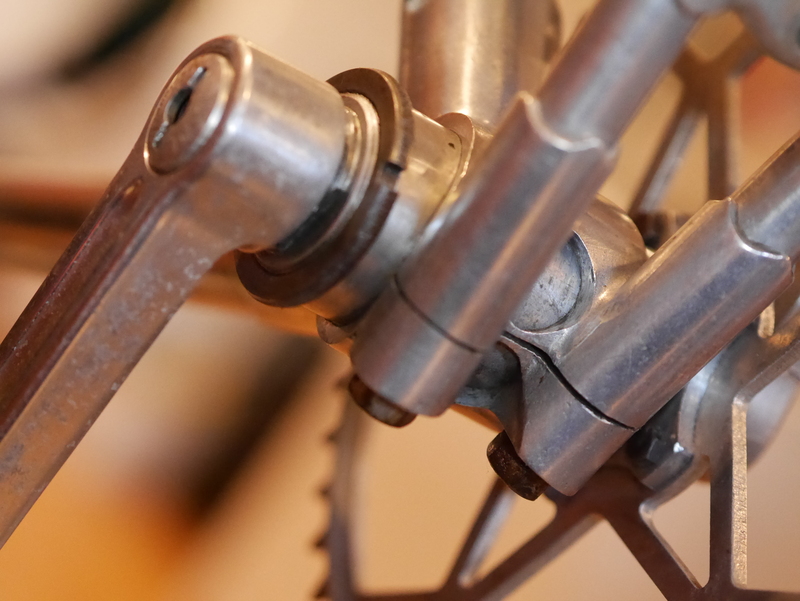 I adjusted the BB shell over about 2mm to provide for additional necessary clearance for the crankset, by taking a mallet and gently tapping the BB. 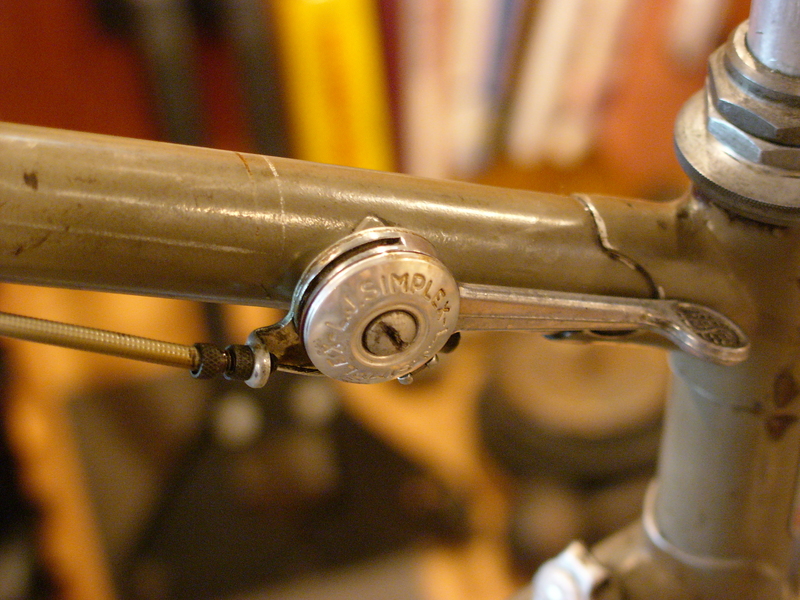 I would not have known about this option had I not seen numerous examples of other duralumin framesets showing the BB shell in various positions. 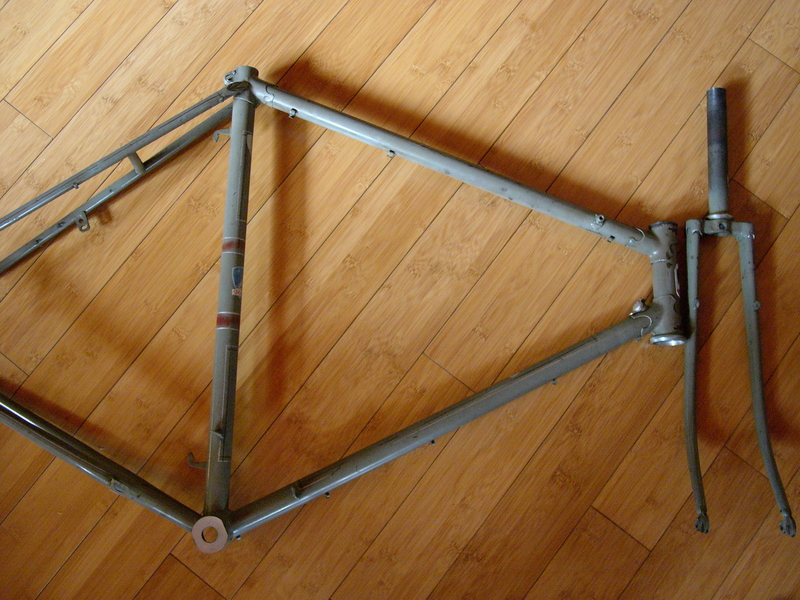 Unfortunately one problem with these frames is that the aluminum chain stay sleeves can fail. 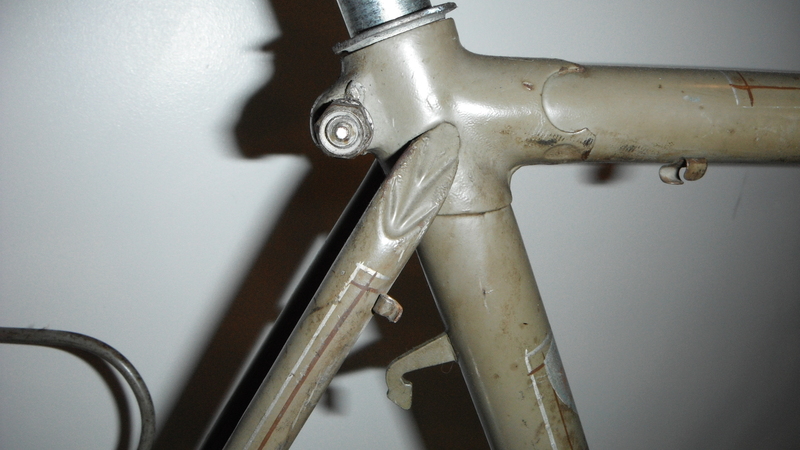 I wanted to give this frame a good shot a lasting through the decades, so by adjusting the BB shell, further damage to the chainstay sleeves will be avoided. 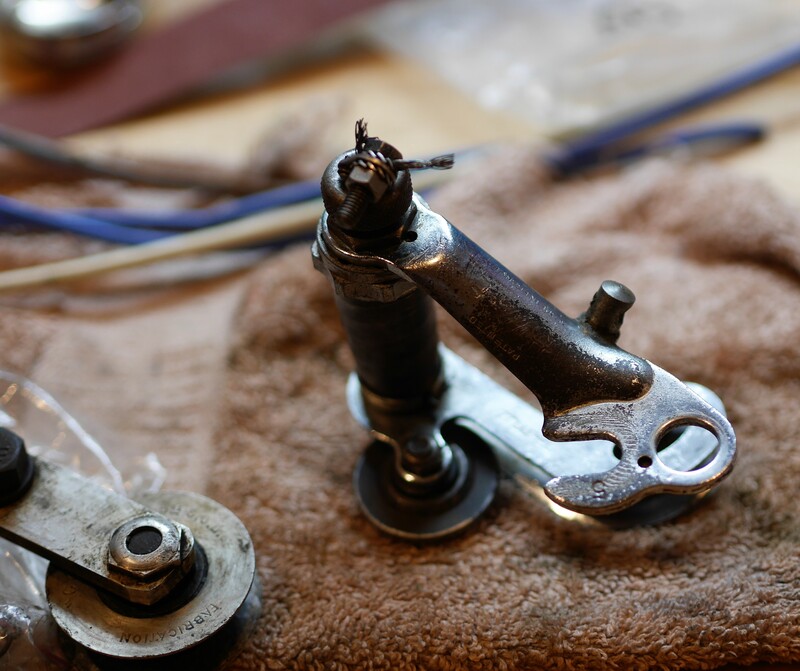 The next steps involve installing the Huret derailluer and shifter, polishing and cleaning the beautiful components, and setting up the brakeset and cables, and installing the tires, as well as cleaning and lubricating the leather saddle. Stay tuned for more torture, and related thrills! 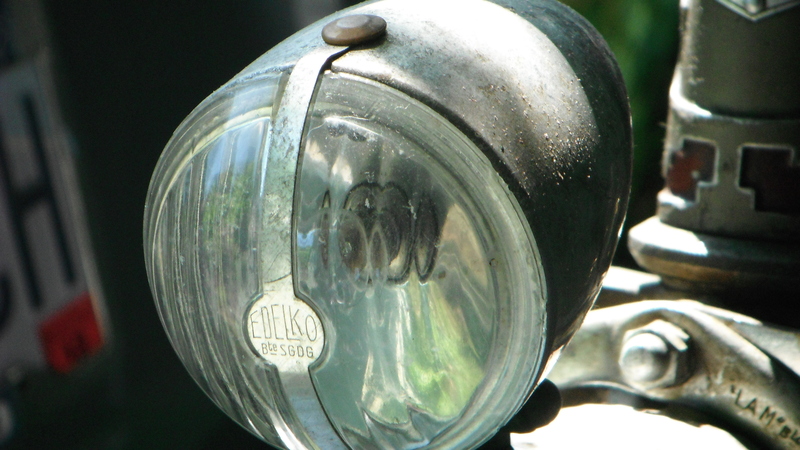 This 1940’s Peugeot was one of the first restorations that I completed. There were a number of challenges, but because the bike was complete and original, it was worth it. 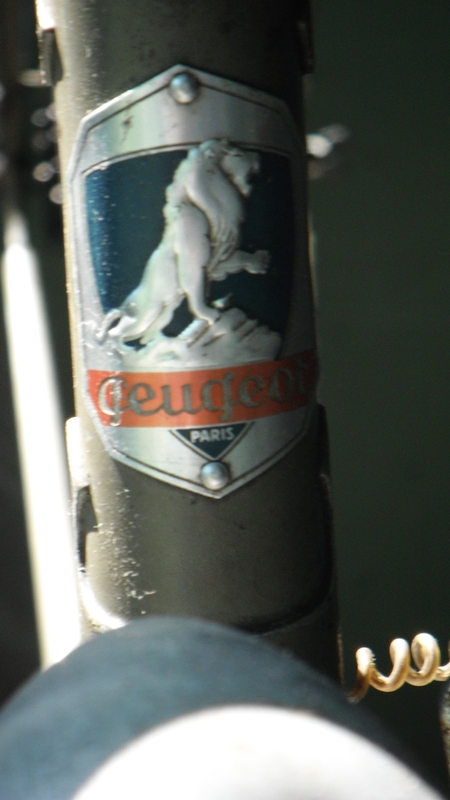 This Peugeot was well loved and well ridden by its owner. 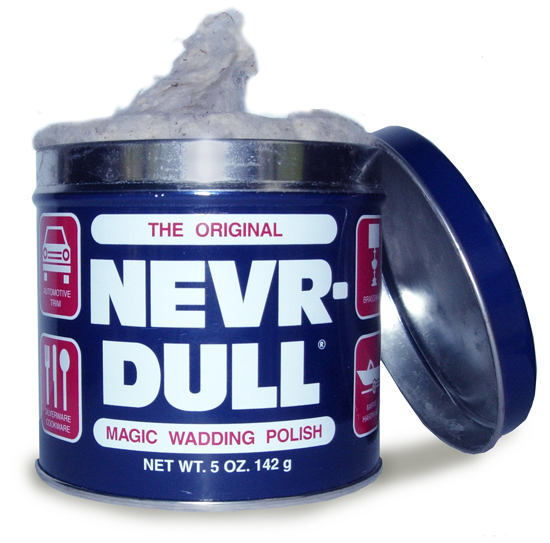 So, I wanted to make it totally rideable again, as well as to preserve its original beauty and function. 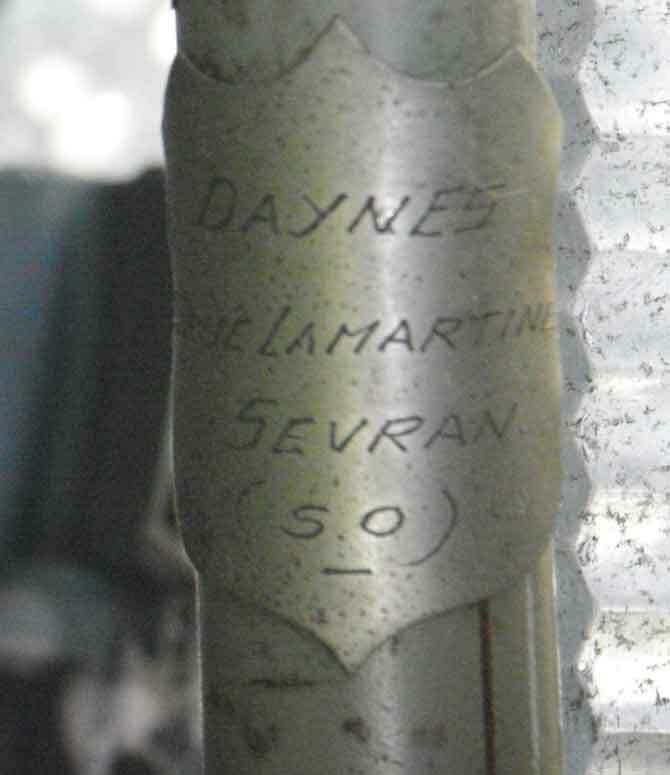 The bike had both keys to the original fork lock, plus the owners engraved tag on the down tube. 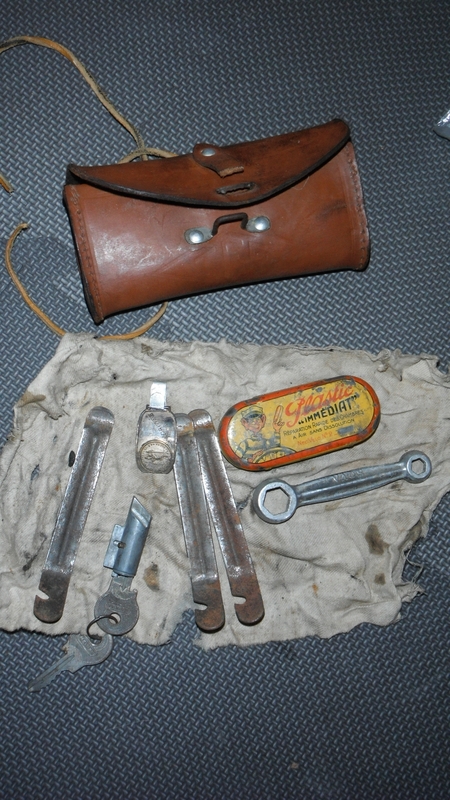 All the reflectors were intact, and the original toolkit bag looked great. 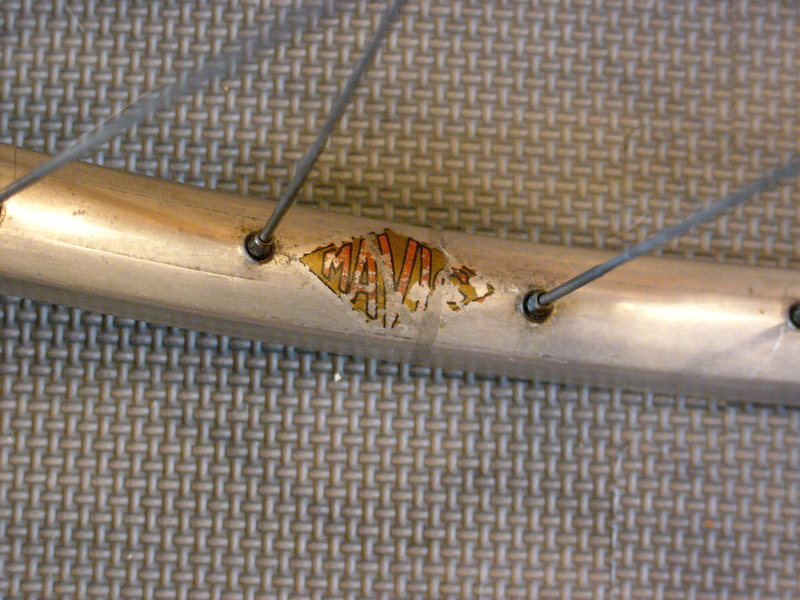 The bottom bracket had a small dent on the underside, and one of the pedal cones was toast. Fortunately, the axles looked good and the other pedal was fine. 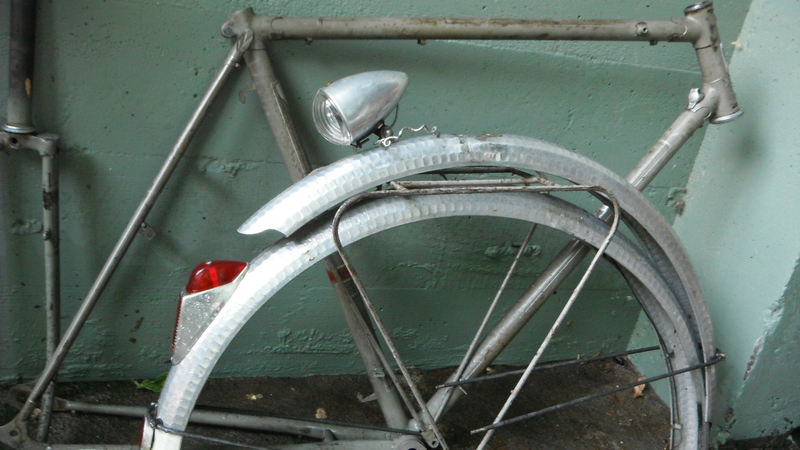 To find the parts necessary to repair these old bikes can be a challenge. 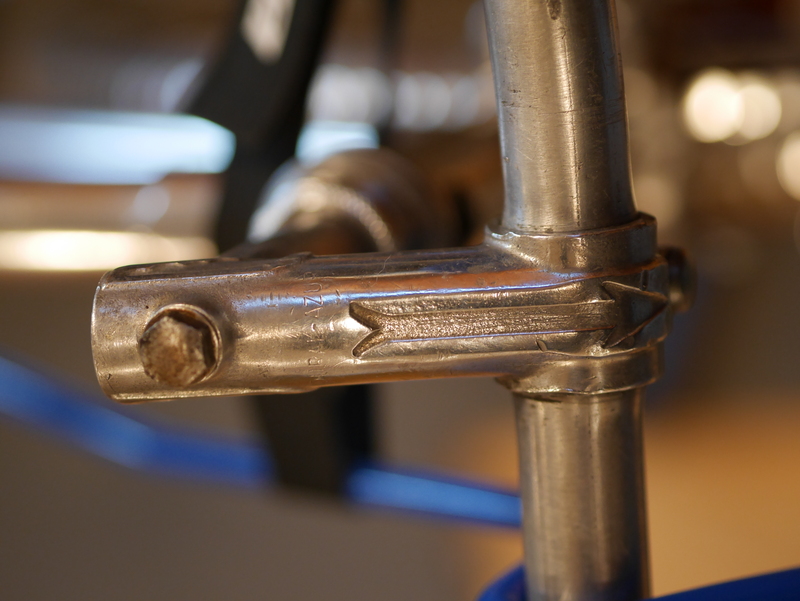 Fortunately I found a replacement cone in my parts bin, and I was able to thread the bottom bracket in without a problem. There were a lot of hours put into cleaning and dealing with mechanical issues. 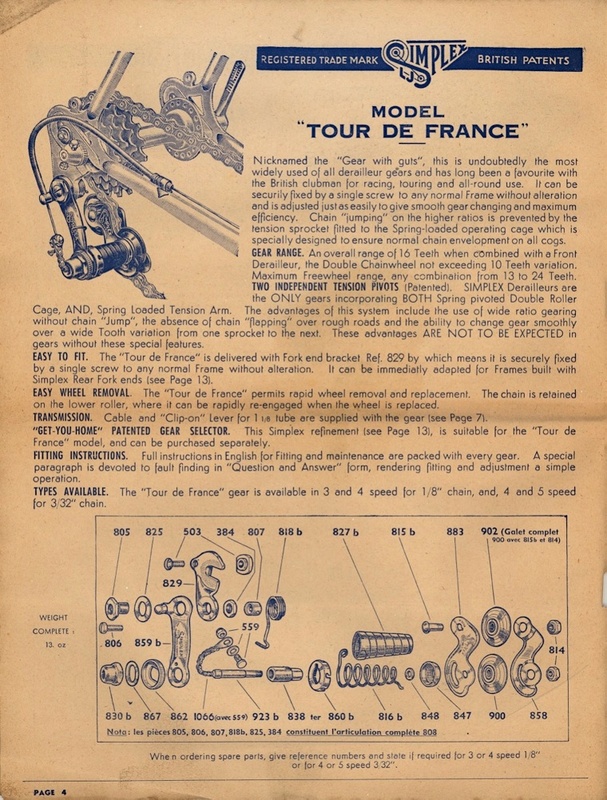 A particular problem was learning how to adjust and set up the Simplex Juy Tour de France rear derailleur. Originally, I had the chain routed incorrectly, but this drawing helped to solve the problem. 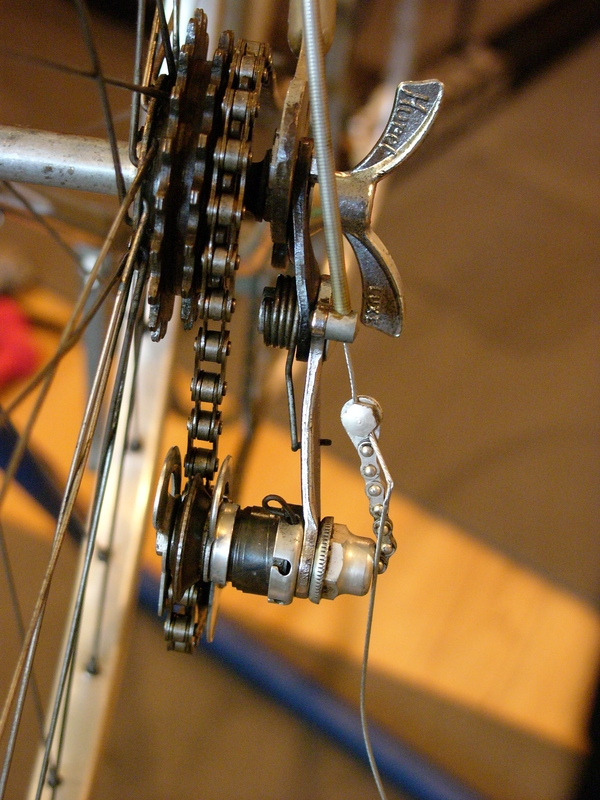 There aren’t a lot of adjustment options in the rear derailleur, so the shifting is still being “fine tuned”. 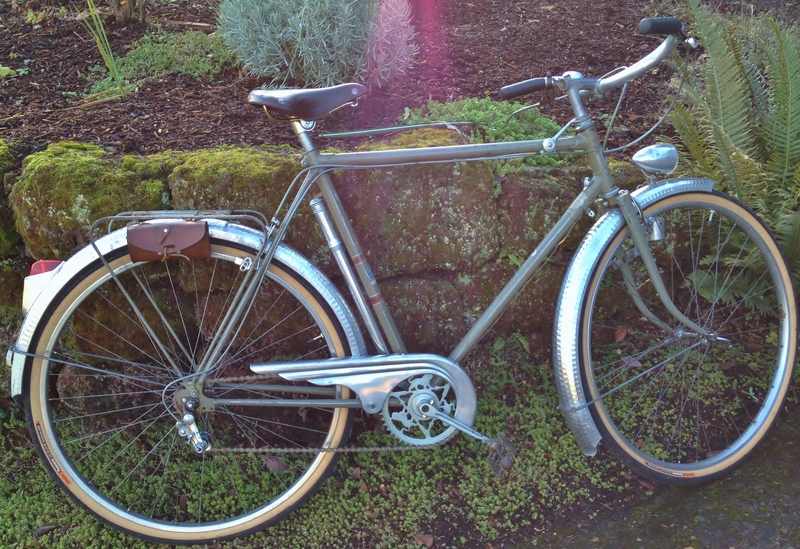 The end result proved well worth all the effort – this is a beautiful and fun to ride bike from the late 40’s. 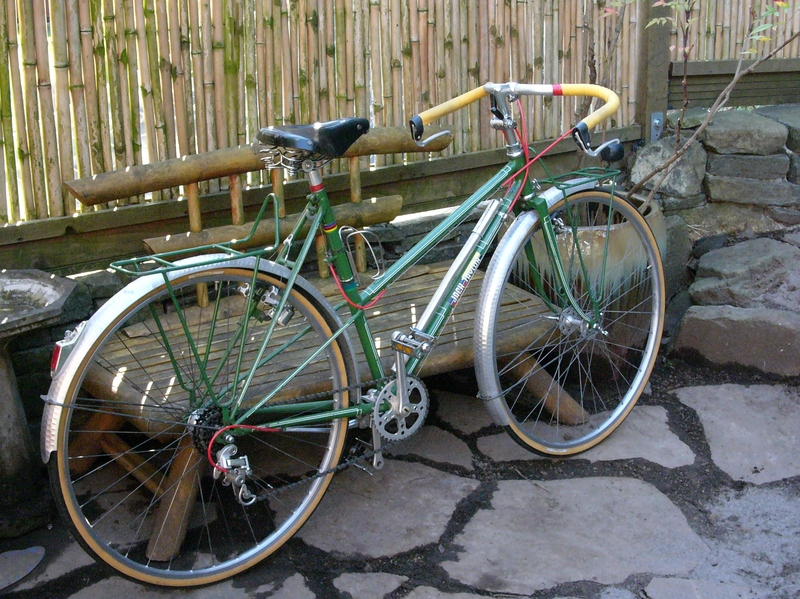 It is equipped with aluminum Mavic 650b rims, Lefol hammer fenders, Simplex Tour de France derailleur, aluminum bars, a rear constructeur rack, a working dynamo with front and rear lights, a complete leather toolbag and kit, Peugeot chain guard, and two keys to the fork lock – all working perfectly. Update January 2014: SOLD! Congratulations to David in California.